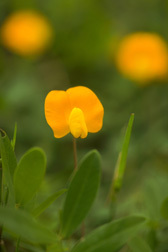 No other perennial warm-weather legume adapted to the Gulf Coast comes close to the rhizoma perennial peanut (Arachis glabrata). It’s often called “the alfalfa of the South” because its protein and mineral content are very similar to alfalfa’s. But as a long-lived perennial in the region, A. glabrata is less costly to grow than alfalfa. 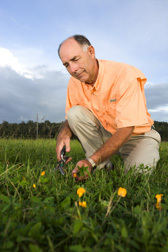 Its recognized quality, persistence, and broad uses are making it a good forage crop in the lower South. Rhizoma perennial peanut has become the premium forage for the Gulf Coast due to more than 50 years of collaborative work among several state and federal cooperators, says Mimi Williams, former forage agronomist at the USDA-ARS Subtropical Agricultural Research Station (STARS) in Brooksville, Florida, and now with USDA’s Natural Resources Conservation Service (NRCS) in Gainesville, Florida. In addition to STARS, the NRCS Brooksville Plant Materials Center and the University of Florida’s Institute of Food and Agriculture Sciences (IFAS) worked on this long-term effort. Williams says that interest in A. glabrata began when a collection of accessions from South America was introduced to Florida in the 1930s. This initial work resulted in the informal release of selections Arb and Arblick in the 1960s, but both had very limited use because of slow establishment and low productivity. That changed in the 1980s, with formal release of the cultivars Florigraze and Arbrook, which produce much higher amounts of forage than the earlier releases. Perennial peanut (Arachis glabrata) blossom. The plant produces blossoms even though it produces very little viable seed. 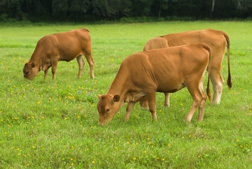 Extensive research conducted by Williams and coworkers at Brooksville in the 1980s and 1990s demonstrated the nutritional value of A. glabrata to livestock and is widely responsible for its current popularity as a hay crop. Horse, goat, and dairy producers in the region imported more than $100 million worth of hay per year before the perennial peanut became available. Adapted to upland soils of the lower Coastal Plain, it’s being used throughout much of the eastern Gulf Coast region, with an estimated 25,000 acres planted in Florida and southern Georgia. Much of it is being grown on row-crop ground that previously had very marginal returns. Now, A. glabrata’s net profit exceeds $1,000 annually per hectare, with current demand for hay exceeding production. Current sales—mainly as hay, but also as planting material and ornamentals—exceed $7 million. “It’s a win-win situation for everyone,” says Sam Coleman, research leader at STARS. “Financially, it makes sense for hay producers to grow perennial peanut, and as long as there are cattle and horses in Florida, there’ll always be a demand,” adds Coleman. Romosinuano heifers grazing a pasture mixture of perennial peanut (Arachis glabrata) and bahiagrass (Paspalum notatum). Researchers are now seeking ways to make the perennial peanut more economical to grow for hay or forage in wetter soils or in more northern areas of the region. Traditional breeding methods aren’t practical because the plant produces very little seed, so new plant material has been sought from its native range in South America. While at STARS in the early 2000s, Williams—working with others at ARS’s Plant Introduction Station in Griffin, Georgia—led two expeditions to Paraguay to find germplasm for expanding the range of perennial peanut. They brought back 85 accessions of wild and domesticated plants for testing. Those plants serve as the basis for the current A. glabrata research by Coleman at STARS; Andrea Maas, a plant geneticist at ARS’s Crop Genetics and Breeding Research Unit in Tifton, Georgia; and researchers from NRCS and IFAS.—By Alfredo Flores, Agricultural Research Service Information Staff. This research is part of Pasture, Forage, Turf, and Rangeland Systems, an ARS national program (#215) described on the World Wide Web at www.nps.ars.usda.gov. Samuel W. Coleman is at the USDA-ARS Subtropical Agricultural Research Station, 22271 Chinsegut Hill Rd., Brooksville, FL 34601; phone (352) 796-3385, fax (352) 796-2930. "Perennial Peanut for Quality Pasturage and Hay" was published in the March 2008 issue of Agricultural Research magazine.